As you know from previous post, I am going for acupuncture. One of the things I have been asked to look at is my diet and what I eat. I have been a creature of habit with my breakfast. I don’t take special time out for it and nor do I eat the right kinds of food. I actually used to have a chocolate chip muffin for breakfast with my cup of tea. I have since stopped buying muffins and opted for a banana and a couple of Rich Tea biscuits. I have been told not to have so many bananas and have mostly cut them out my diet. 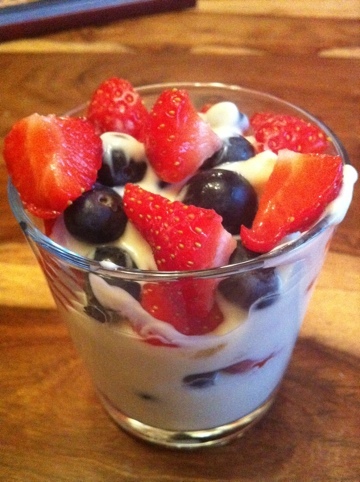 It’s granola mixed with tropical yoghurt and strawberries and blueberries added. It looks far too healthy for what I would have. In fact, it took a little while for it to actually agree with my stomach. What I do like about it is that I could have it anytime and if try hard, it d taste like a fruit dessert. Mind you, I always thought it was wrong to mix fruit or anything healthy with something so sweet. I am slowly coming around to that idea now! On my lazy days when I’m not so prepared, I opt for Belvita breakfast biscuits. Well, if they’re good enough for Lisa Snowdon! Come to think of it, I wonder if she does have them everyday? If you have other healthy options I could try then please feel free to let me know.